Well, this novel really was delightful. I’ll be honest with you – I read this book as a rebound after finishing a crime novel that totally freaked me out. So it’s like the time I watched Rock of Ages – and was so totally disgusted by Stacee Jaxx (aka Tom Cruise) that I needed to watch Top Gun in order to restore him (aka Tom Cruise) in my mind. Mind you - I'm not a huge Tom Cruise fan, but I love Top Gun, it's my favorite. If you’re not a fan of Top Gun – leave now. I don’t need that kind of negativity in my life. So that’s what this book was for me; a way to get rid of all the icky feels and replace them with warm fuzzy thoughts. And it totally worked! Anything You Can Do by R.S. Grey is a super cute, witty romance (ie: there are steamy scenes, please be advised) novel that is just so fun that I read it in a day. Daisy and Lucas have been at war with one another since they were kids; their long-standing childhood and adolescent rivalry is legendary in their small Texas hometown and after graduating high school they are going to get as far away from one another as possible. Years pass as Daisy and Lucas attend colleges on separate coasts – each drifting apart but never forgetting their undying hatred of the other. Now, after years of schooling and medical residency, Daisy is returning home to take over the small family medical practice in her hometown. What she doesn’t know: Lucas has come home too and he’s going to be working right beside her in the same practice with the same goal of taking over when the current owner, Dr. McCormick retires. Witty banter, hilarity and some pretty steamy scenes ensue. Think: Grey’s Anatomy’s On Call Room + No Strings Attached + Hart of Dixie’s small town charm and you’ve pretty much got this book. As you can imagine – this book is incredibly predictable. But as with most romantic comedies, it’s the journey, not the destination, right? We all know where this is leading – but the fun part is getting there. I thought the banter between Lucas and Daisy was hilarious, the chemistry was off the charts and this book was just so fun. Daisy is a total knothead – I wanted to smack her in the face with her own book a few times, but she comes around eventually. Lucas is almost too good to be true, but for the sake of fictional characters in this genre, he’s better than most so I’ll take it. Here’s the thing, in my opinion, most romance novels are not well written (please see: Fifty Shades). 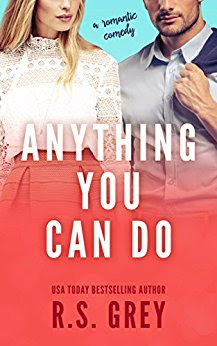 There is only so much steamy, instalove, spontaneous shagging one can take – and so often I veer away from this genre, but this book was actually well written and smart! The fact that this was well written yet very readable, had me actually laughing out loud and was fun made this a great read for me. If you’re looking for a book to clear out the scary remnants of the last freaky crime novel you read – add this book to your TBR. It’ll do the trick, I swear.